Her is an oldie but goodie in the Christmas recipe genre. 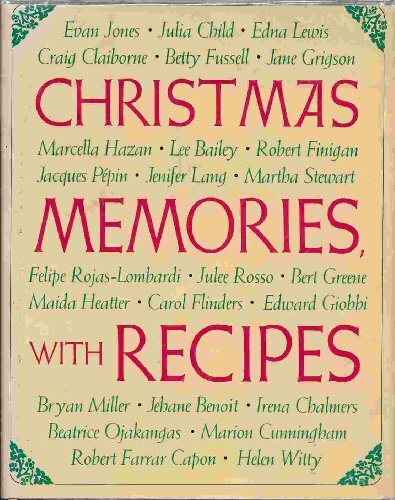 Christmas Memories with Recipes was published in 1988. It includes most of the big name food faces of the 70' and 80's. This is very interesting as you look at all the foodie faces of today and wonder who will we still be talking about in 2050! This is a wonderful collection featuring a young Martha Kostyra Stewart and Jaques Pepin to the august Maida Heatter and Craig Claiborne. The stoically British Jane Grigson to the wildly Italian Edward Giobbi with a bit of Lee Bailey's Southern charm thrown in. 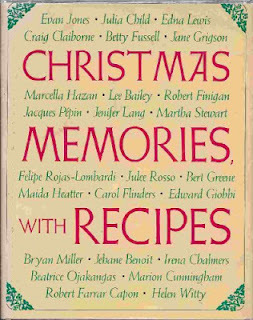 Basically, each person tells stories of their favorite Christmas memories and includes in the recipes that made it great. For Edna Lewis, Christmas began in September when she was sent out to collect nuts for fruitcake. IT was the children's job to gather the nuts, crack them and extract the meats from the shells. Every sunny day in September, her mother set out to make the fruitcakes. Through October and November they were doctored with spirits until they saturated for giving. Here is her recipe. Mix all the fruit in a large bowl and pour in the wine and brandy. Stir gently and set aside to marinate for a few hours. Butter a 10-inch tube pan or two 9 x 5 x 3-inch loaf pans and line it (or them) with clean parchment paper. Butter the paper. Sift the flour with the spices twice. Add the baking powder and salt and sift again. Put the butter into a large mixing bowl and cream until satiny. Add sugar and, using an electric mixer, cream until light and fluffy. Beat the egg yolks slightly and then add them to the bowl. Mix the batter well before you start to add the flour-spice mixture. Stir the batter as you add the flour, a little at a time, stirring well after each addition. When the flour is thoroughly incorporated, add the molasses and stir. Finally, stir in the fruit and any soaking liquid in the bowl. Put the egg whites in a grease-free bowl and beat with a clean beater until they hold stiff peaks. Fold them into the batter thoroughly and then spoon the batter into the prepared pan ( or pans ). Cover loosely with a clean cloth and let the batter sit overnight in a cool place to mellow. On the next day, heat the oven to 250 degrees. Place the fruitcake on the middle rack of the oven and bake for 3-1/2 to 4 hours. After 1-1/2 hours, cover the pan with a piece of brown paper (do not use foil) or set the pan in a paper bag and return it to the oven. When the cake has baked for 3-1/2 hours, remove it from the oven and listen closely for any quiet, bubbling noises. If you "hear" the cake, it needs more baking. Or test the cake with a toothpick or cake tester. If the toothpick or tester comes out of the center of the cake clean, the cake is ready to take from the oven. Put it on a wire rack to cool, still in the pan. When the cake is completely cool, turn it out of the pan (pans), leaving the brown-paper lining on the cake. Wrap the cake with parchment, then aluminum foil, and pack the cake in a tin. Homemade fruitcakes need air, so punch a few holes in the lid of the tin or set the cover loosely on the tin. Set the tin in a cool, undisturbed place, and every two or three weeks before Christmas, open the foil and sprinkle the cake with a liqueur glassful of brandy, wine, or whiskey. The liquor will keep the cake most and flavorful and help preserve it as well. On Christmas morning her father would wake the children and set off Roman candles. I am sure that today there are local ordinances that would prevent fireworks on Christmas, but fruitcake is still acceptable.